It would be almost impossible to start a small, family-run winery today, considering the huge costs involved. It's now a game for billionaires. But, to many, that game can be played different ways. Many large wine operations grow by buying up small operations and putting them into their portfolio. It's the bigger-is-better theory, and sometimes it works. But, that's not how Bill Foley works. Bill was a corporate attorney with a fierce interest in wine. The call was strong enough that he finally bought a small winery in Santa Barbara 25 years ago and kept it just as he found it: small, vibrant and respected. He slowly added others to his portfolio, and today he owns 25 properties around the world. Discoveries is one of those properties and it exists, as do the rest in the family, as a self-sustained operation that values its roots as well the environment. Every winery in the Foley empire is known for quality before anything else and Discoveries is no exception. Pinot Grigio didn't exist in California 25 years ago. The grape was grown for winemaking in Italy as well as in Alsace, where it was called Pinot Gris. It took California a while to catch on, but it finally did, and this marvel is a perfect rendition of the grape. 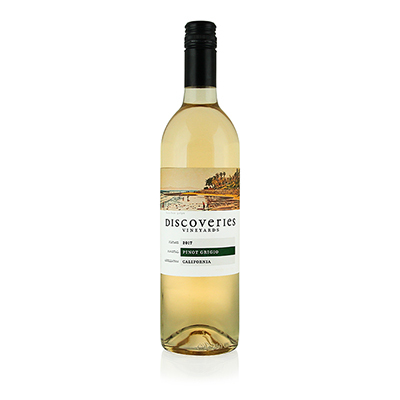 As with its European counterpart, our selection is ripe with fruit flavors of pineapple, peach and quince. It sports an exotic aroma redolent with those same scents and a dynamic finish.